Woodland Park Zoo Blog: Allegory of the senses…mmm smells like Fruit Loops? Allegory of the senses…mmm smells like Fruit Loops? Hello spring! Above is the flowering currant (Ribes sanguineum). Below is a fresh green sprout from an Indian Plum (Oemlaria cerasiformis), little green slivers of warmer days ahead. This is a view from the side—some pretty intense architecture! This plant is native to the Pacific Northwest, ranging from BC, Canada all the way to Santa Barbara, CA. A sure sign of spring, Indian Plum is among the first plants to leaf out and flower. You can begin to see delicate white flowers emerge from the buds. People used to make tea from the bark, and chewed the twigs to use as a mild anesthetic. These beautiful specimens of Garrya elliptica, the coast silktassel, are almost opalescent. The flowers appear in long, slender hanging clusters called catkins and there are male and female flowers on separate plants. This time of year it is in full bloom and really spectacular. These bodacious pink clusters are part of the Viburnum bodnantense or simply, Dawn. This plant is a hybrid developed in Germany by crossing the Chinese V. farreri with the Himalayan V. grandiflorum. The flowers have a lovely perfume which is sweet-smelling, and the leaves can smell distinctly citrusy. The flowers are pinkest and most vibrant in winter when deciduous leaves have fallen and the stark branches show only bright pink buds and baby pink blossoms. You can find them at the entrance of the Woodland Park Rose Garden. These dangly bits are from the spiketail (Stachyurus praecox) near the Rose Garden. Its crisp green color is intense! PANTONE 13-0632 Endive, for all you color connoisseurs. The seed was traditionally used as a black dye in Japan. One of my favorite places to slip away to is the Jaguar Cove. The space itself is beautiful; conjuring a luscious and wild rainforest. The winding paths, the crystal clear pool, and of course the jaguars, (whether napping, swimming or sneaking across a log) are absolutely spellbinding. This time of year, when most of grounds are still asleep in a floral hibernation, a mysteriously sweet fragrance breezes blissfully through the cove. Sweet box (Sarcococca). The sweet box shrub has glossy leaves and sweet-smelling, dainty, white flowers almost hidden in the foliage. Standing very near this plant, it’s hard to detect much of a scent, but stand back a few feet and let the breeze scatter the sarcococca’s piercingly sweet fragrance all around you. When I first experienced this sensation, I never suspected such a tiny flower! Above you can see the individual stamen and pollen dust. Meet the Cornelian cherry (Cornus mas) in front of the Adaptations Building. The wood of C. mas is extremely dense, and unlike most other woody plant species, sinks in water. This density makes it valuable for crafting into tool handles. 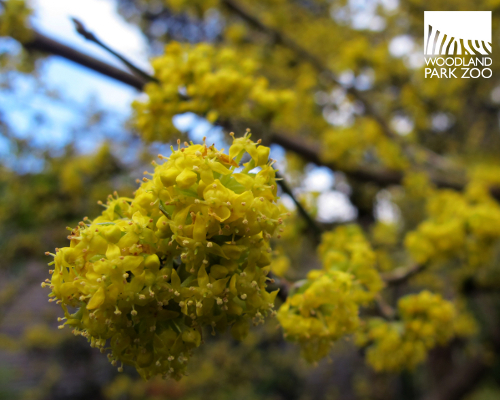 Cornus mas was used as early as seventh century BC by Greek craftsman to construct spears, javelins and bows. We use it for constructing beautiful yellow backdrops! Witch hazel (Hamamelis mollis) grows near the benches at the tiger viewpoint. Its pale yellow tendrils are so elegant! Lonicera fragrantissima at the entrance of the African Village is definitely one of the most surprising. This delicate pearl flower goes by a couple common names such as Winter honeysuckle or the more evocative Sweet-breath-of-spring. Some people think this one smells like fruit loops! Early springtime is the absolute best season for scouting out bursts of color and fresh blossoms like these crocuses ready to flower. Visit our What’s in Bloom guide to learn more about all the seasonal flowers at the zoo including these pops of Laurustinus (Viburnum tinus). P.S. Can you keep a green thumb secret? Here is a peek at one of our horticulture team’s most top secret gardening contraptions! Keepers collect browse throughout our lush grounds to give to the animals. 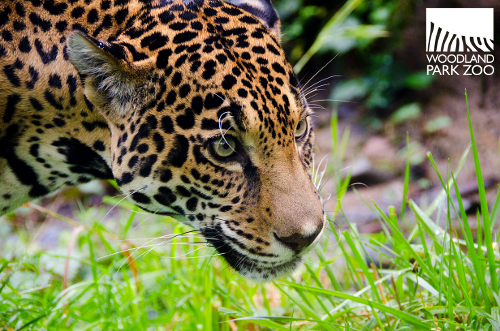 Photos: Jaguar photo by Ryan Hawk/Woodland Park Zoo. All other photos by Kirsten Pisto/Woodland Park Zoo. Not a hort bike. Keeper out chopping up the scenery for browse. Agreed. That trike belongs to a keeper collecting browse... not the Horticulture Department.